Ex-Sudan president Omar al Bashir. It is a startling statement from anyone living in the settlement down the Nile from Khartoum – long seen as one of Bashir’s firmest power bases and his tribe’s main town. Shendi has not seen any of the mass protests against Bashir’s rule that have rocked much of the rest of Sudan for the past six weeks. But it has not escaped the economic hardships driving the unrest. As Kheir speaks, other residents stand outside bakeries while cars queue for scarce petrol. Not everyone in Shendi shares Kheir’s views. Emad Abdel-Rahman (53) defends Bashir and does not want to see secular activists taking over. That anyone there is willing to call openly for the replacement of Shendi’s most famous son underlines how far even government strongholds have been shaken by the nationwide demonstrations. Residents debate Bashir’s record. Some complain food prices, even locally-produced vegetables and meat, rise as inflation soars. “Yes, Bashir is the son of this region, but 30 years is enough,” says a 27-year-old woman. Bashir was born in 1944 in nearby Hosh Bannaga, went to school and grew up in Shendi. Supporters give Bashir credit for Shendi’s university, its hospital and a bridge crossing over the Nile opened in 2009. Detractors talk about unpaved roads. In Hosh Bannaga, many live in mud houses along dusty roads, where donkey-drawn carts travel back and forth. Sudan’s economic problems – ranging from severe cash shortages to spiralling inflation – are exacerbated by the loss of three quarters of its oil reserves since the secession of South Sudan in 2011. Foreign investors stay away, unwilling to do business with a country whose leader is wanted by the International Criminal Court on charges of masterminding genocide in Darfur – charges he denies. 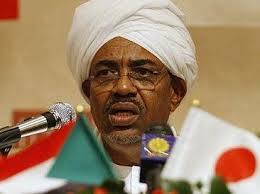 Bashir blamed unnamed foreign enemies and foreign sanctions. He promised more investment and lobbying to have the country removed from a list of countries, along with Syria, Iran and North Korea, Washington considers state sponsors of terrorism. “We have no personal problem with Bashir, provided he fixes our problems, and provides bread, fuel and jobs,” says a 19-year-old university student.